My most recent post is from November 2013, and it says “I’ll be doing this tomorrow,” which now makes no sense. Maybe it’s partly because of the sour taste that event back in November left in my mouth, or maybe it’s something else, but I haven’t felt any desire to post anything. It’s not that nothing is happening; I think I’ve just been enjoying keeping to myself lately. Scott Pinkmountain and I had a conversation about ambiguity in which I artlessly referred to Lorde’s song Cities, among other things. It’s a hard subject, and plus I’ve talked so much about ambiguity in the past, mostly with friends like Scott or in other places, that my ideas seem pretty stale to me, but in case you’re intrigued (and if you want to read Scott’s really insightful comments), check it out here. It’s part of Scott’s “Surviving the Arts” blog on Pank. Scott is great, he’s doing so much cool stuff, look him up and check out his music and writings. As for the event last November, I played some Pink Thunder songs at a TEDx event near Boston. I specifically decided not to give a TED talk. I don’t think anyone who speaks for himself as an artist can take on that whole breathless, technological-utopian TED talk thing. We have our own voices, and that’s how it should be. I played the songs and said a few words, like it was an annotated concert, rather than a talk with a few songs in it. The whole time I was performing, I felt like I was a mile away from the audience and the lights and cameras and the big timer ticking down etc. I stood on one of those red TED carpets. I think they were expecting me to talk about digital music and technology, two subjects about which I can go on at length, but almost entirely in a negative direction, which, again, doesn’t really scream TED. I actually want to say some things about music, the internet, etc at some point (not right now – see above), but why go there to scold people? I stood there for new possibilities for songs. I’m happy with that. It felt bad but probably wasn’t quite as bad as it seemed. I got two comments after I played, both of which were essentially of the “I don’t get it” variety. There is a video of the performance (you can look it up if you really want to, but I’m not sending anyone to it), and the only comment there (as of a few weeks ago) is “I don’t get it.” I think, all things considered, I can consider that a good thing. I’m finishing a new composition for flute, clarinet, violin, cello and piano. It’s called “Fits,” and after spending most of the past 9 months or so on it, I feel like I want to make it much simpler, which I can’t really do without totally changing its nature. I have a week coming up where I can totally focus on it and try to make all the parts as playable as possible. It feels like a luxury. It will be performed in May. I’m also starting to think again about the record of new songs (technically) that I started back in 2011, or was it 1011? That’s going to happen this summer. It was a fun thing to be obsessed with for a minute. Nate and Merrill aka tUnE-yArDs have the space next door to us and I’m sure everyone knows to be on the lookout for their new record Nikki Nack on May 5th. It’s nice when great musicians are also great people. There, I posted. Play on, players. I’ll be back. I’m in Boston and tomorrow I’ll be playing some Pink Thunder songs at the TEDx Beacon Street event. I am very glad to be here and interested to see “TED people” up close. I will report back. A night of songs, music, art, and projections. Non-poems made from, with, around, and through poems. Daniel Redman has been setting Walt Whitman’s queer epic Leaves of Grass to music for the last seven years. He has set and memorized forty-seven poems to date, and he sings them. Exray’s – Jon Bernson and Michael Falsetto-Mapp specialize in lo-fi electronic pop made with precarious beats, short circuited melodies and voicemail vocals. Pink Thunder Portmanteaus – Combination music-player / art-objects containing songs from Pink Thunder – songs made from unchanged poems by living American poets. Jorrit Poelen projects distorted, noisy collages of animated images onto skin, screens, walls, and floors using “Pooks,” a custom-built visual instrument. Michael Zapruder writes songs and composes concert music. His recent Pink Thunder fashions free verse pop-art songs from poems by eminent contemporary American poets. We are thrilled to be curating this event at LitCrawl in San Francisco this year. Ex-verba means “from words” (we think. roughly). So for LitCrawl we dreamed up this one-of-a-kind show of non-poems made from poems. Jorrit Poelen’s projections of distorted, noisy collages of animated images – MADE FROM LETTERS OF POEMS! – onto skin, screens, walls, and floors using “Pooks,” a custom-built visual instrument. Mark your calendrinos for SATURDAY OCTOBER 19th! Very excited about this event on Sunday! It’s Sylvie Simmons’ book release party for the paperback edition of her Leonard Cohen biography I’m Your Man. Lots of cool LC-related stuff (I expect Sylvie will do a reading), plus a bunch of people will sing Leonard Cohen songs. I’m doing “Going Home,” from Old Ideas. The major, soul-searching biography that Leonard Cohen deserves … Mesmerizing. Not sure how I missed this, but wow – thanks to Hinged Journal of Converging Arts for this review, which is not only very thoughtful and insightful, but which, in a dynamic that no longer comes as a surprise, is a much better music review than any of the actual music critics have written. The great folks at Largehearted Boy invited me to do a Book Notes for their blog, so I did! The very good, thoughtful Christopher Connor interviewed me for Zyzzyva about poems, songs, Pink Thunder, and that is here. Studio One in Oakland, TONIGHT! Finally back home, and Kevin and I will be playing the Pink Thunder songs tonight with readers Matthew Zapruder, Jason Bayani, and Gillian Conoley! Studio One’s Sheila Davies Sumner asked me some very interesting questions about Pink Thunder, and, although I don’t know if they are interesting or not, I gave her some answers here. Come to Studio One tonight! Kevin and I are in Iowa and it’s excellent! Chicago – Rational Park! Danny’s Tavern! Mission Creek Festival! Tomorrow night, March 30th at 7pm! I will be reunited with the Pink Thunder portmanteaus and will get to see the Rational Park Exhibit for the first time. I’m excited. And then, on Tuesday April 2, I’m really looking forward to talking about songs and poetry, and playing some songs, in dialogue with Billy Blake and the Vagabonds as part of the venerable Danny’s Reading Series. And as if that’s not enough, on Wednesday April 3, Kevin and I will be performing at The Mill in Iowa City, as part of the fantastic Mission Creek Festival, which you should fly to Iowa for. We will be supported by Christopher the Conquered. In celebration of Michael Zapruder’s Pink Thunder, a New Collection of Songs Featuring Collaborations from 23 Poets. Performance: March 30, 7pm, Rational Park. FREE. Rational Park is excited to host 22 portmanteaus, each containing a song from the album Pink Thunder—a collection of free-verse pop art-songs, including contributions from 23 poets, three engineers, and a few dozen musicians. What began as a bus tour that brought together hundreds of American poets has been recorded and remixed into a potent collection of poem-songs. Pink Thunder features instrumental contributions from over forty musicians and poems from Noelle Kocot, James Tate (MAKE #10), Bob Hicok, Mary Ruefle (MAKE #9), D.A. Powell, Dara Wier (MAKE #9), Joshua Beckman, Travis Nichols (MAKE #6), Dorothy Laskey (MAKE #8), Matthew Rohrer (MAKE #2), and many more. The album was released on October 16, 2012 via The Kora Records, and the corresponding hardcover book of poems, with CD, it out now from Black Ocean. Saturday, March 30, 7pm, Michael Zapruder and friends perform a full set of Pink Thunder songs among the portmanteaus. This special live performance is free! Refreshments served. presented by Rational Park, Black Ocean, Danny’s Reading Series, and MAKE Literary Productions. For more information about the events, participants, and sponsors,click here. Rational Park is located at 2557 W. North Ave, Chicago, IL 60647. 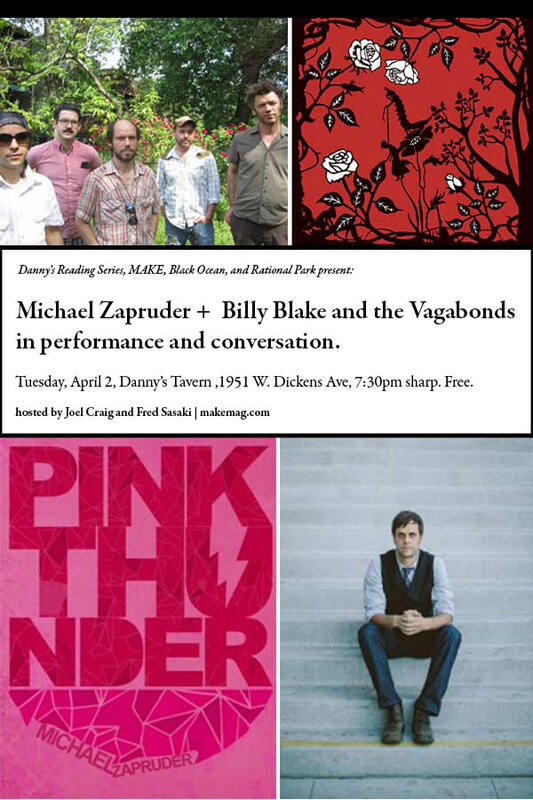 Tuesday, April 2, Billy Blake and the Vagabonds + Michael Zapruder in conversation and performance. Tuesday, April 2, kick off Poetry Month by spending an evening with two poetry/music projects. Members of Billy Blake and the Vagabonds will join San Francisco-based musician Michael Zapruder and friends to perform a few selections from their latest albums, then discuss the process of writing songs around the framework of poems—for Zapruder, from his contemporaries, and for Reid Coker, Kennedy Greenrod, and Saleem Dhamee, the poems of Romantic poet William Blake. Danny’s Tavern, 1951 W. Dickens Ave, Tuesday, April 2, 7:30 p.m. Hosted by writer Fred Sasaki and MAKE Poetry Editor and Danny’s Reading Series curator, Joel Craig. Rational Park, the wonderfully-named gallery/art collective in Chicago’s Humbolt Park, is showing the Pink Thunder portmanteaus from March 22 – April 12! This is the second public exhibition of the portmanteaus, and the first outside of the Bay Area. The opening party is Thursday, March 22 from 7-10pm. I will be performing at the gallery at 7pm on Saturday, March 30. The portmanteaus will be available for viewing/listening by appointment anytime until April 13. Go to them. They are as friendly as they are strange. This is going to be great. GREAT! A round table discussion about poetry and music from 4-5pm, then concerts from 6:00 to 7:00 and 7:30-9. With DAVID GRUBBS and SUSAN HOWE! ROY NATHANSON! WAYNE KOESTENBAUM! MOHAMMED FAIROUZ! INFUSE CHAMBER ENSEMBLE! I’m very honored to participate in this event, so much so that I flew back from NYC to Oakland (had to do a thing) and am currently flying back to NYC. Would love to see some friendly NYC faces there. It’ll be worth it! Abroche su cinturon de seguridad, people. NYC: Early Show at Lillian Vernon Writers House! This evening, 5pm. Kevin and I will be playing Pink Thunder songs at the Lillian Vernon Writers House. It’s going to be great, and it’s free. Hope to see you NYers there!! This Friday Night in Berkeley! We’re very excited to be playing Pink Thunder songs at this event. A number of fine, fine poets will be reading, including but not limited to MY BROTHER MATTHEW, who excels in both poetry and racquet sports. Ok, maybe he doesn’t excel in racquet sports, but he’s pretty good. He does excel at poems. Music and poetry have long been interwoven forms, but rarely has their connection been as evident as in Michael Zapruder’s new album/book Pink Thunder (Black Ocean), wherein each of the 22 tracks is a free-verse poem, adapted from works by various poets. In celebration of this work, University Press Books is proud to host Michael for a performance of his new album. The event will also feature Kazim Ali, Indira Allegra, Travis Nichols, Christopher Sindt, Laura Walker, and Matthew Zapruder, all of whom will be reading poems which they consider, in some way, to be songs. We hope you will be able to join us for this unique and exciting event! BAY AREANS: YOU SHOULD COME. Most recent and arcane news first: I just put the finishing touches on Peaceful Tricks, an 8-minute piece for clarinet, violin, cello and piano. It’s going to get a reading next month by a great ensemble! Poetry Crush, which put Pink Thunder on its Holiday Crush list. We have a bunch of events coming up in the next two months which I’ll post about in more detail soon. We’ll be in New York, Northampton, Boston, Chicago and Iowa City! For now, you can see the basics on the calendar page. And one last bit of exciting news: the Pink Thunder in Portmanteaus art show will be traveling to one of the cities mentioned above in March/April! I’m so excited!! More on that soon. There’s been some confusion about the show on Sunday, so here are the exact details. There will be a closing show for the portmanteaus art installation at The Curiosity Shoppe from 6-8pm, followed immediately by a reading and concert next door at Amnesia from 8-10pm! The readings will start at 8 and the music will start at 9pm sharp! And Kevin Seal and I will be playing a bunch of the Pink Thunder songs in duo + volunteers (yes, that means you!) format! If you see different information out there on the web, it’s wrong y’all! It’s going to be a great night! Please come.